Nancy Smillie does not offer any booking services that we know. You can always contact them to check. Nancy Smillie and her super basement gift and home furnishings shop are perfect for the West End of Glasgow; tasteful, funky and unique. Knowing her customers well, she can be relied upon to find you just the right gift for that special occasion, or for that somebody who is so hard to buy for. Or maybe when you visit, you'll decide that today it's time you bought for yourself. Either way this wonderful treasure trove will help you out. Great news! Finding this page means you can now join our VIP list for Nancy Smillie. 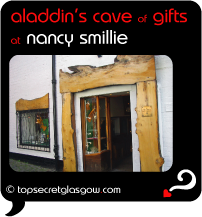 Grab your very own web page all about Nancy Smillie. Do you have a special story about Nancy Smillie? A funny experience? A grand occasion? A funky photo? A personal tip? A top secret? public Lilybank Gardens/ University Ave (LLP) in the hood! underground Hillhead in the hood!